With Scottish blood in my veins, I cannot throw away parts and pieces. The last post, Modern Towers, was made up of leftovers from another quilt. It was so satisfying, so I'm trying another. This time the leftovers are from K-5, a kaleidoscope using Ricky Tim's method. (Click on K-5 to see it.) You make strata and cut out mirror-image pieces. It is great fun, but leaves many triangles of strata. I sat down with a sketchbook and came up with a way to use them. First, I cut them all the same size with the lines going parallel to one right-angle edge. Then went to the local fabric store and found a complementary color for the background. From this, I cut pieces to join the bias edges, and strips to attach them to the rectangular pieces (also leftovers). This picture is the leftovers up on the wall with the background pinned to it. The strip is actually 12 triangles, so about 52" long x 6" wide. I decided the quilt size - it will be narrower on the left, wider on the right. Next task is to cut those pieces, sew them, then get a backing/batting and put it on the machine. I'm going to use a modern, angular panto to quilt it. More photos soon! P.S. 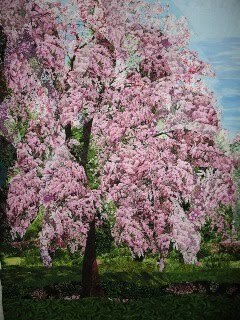 Kali's Cherry Tree also got a "Viewers' Choice" - I am so blessed!! Congratulations on viewers choice! That is really an award! Viewer's Choice is a fabulous award - congratulations!! !